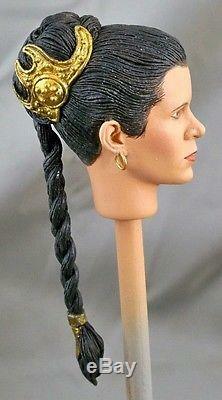 Custom 1:6 scale portrait sculpt of Carrie Fisher as Slave Leia from Star Wars Episode VI: Return of the Jedi. Portrait comes fully painted and ready for display. Designed to fit a standard 12 body. Available with or without a neck. The item "16 Custom Head of Carrie Fisher as Slave Leia from Star Wars Return of the Jedi" is in sale since Wednesday, December 12, 2018. This item is in the category "Toys & Hobbies\Action Figures\TV, Movie & Video Games".